I am running a little behind schedule on this – I’m at my parents’ farm, where the mobile broadband is a bit ropey, and looking after my six year old daughter, while also trying to complete two columns for work. I will catch up later in the week. 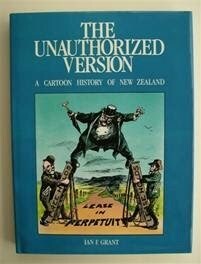 Ian Grant’s “The Unauthorised Version” is a cartoon history of New Zealand, and has recently been updated for at least the second time. The edition in the picture is the first one, which came out in the early/mid 1980s. Anyone wanting a potted, enjoyable history of New Zealand could do a lot worse. The book is a quite brilliant summary of our history: it has a bias towards the political, as you would expect, but given its approach it manages to cover quite a lot of ground. It packs in as much information as the Penguin History of NZ or other similar one volume tomes, but does so in a light way. We have produced a number of world class cartoonists in our history and all the big names, and a lot of the little ones, are included.